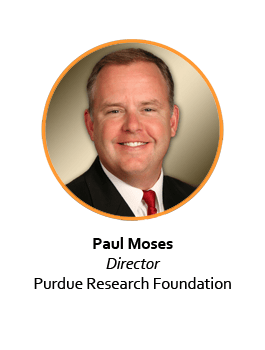 Paul Moses is a Director for the Purdue Research Foundation, managing the Purdue Technology Center of Southeast Indiana and its high-tech incubation program. Moses has developed a portfolio of 12 high-tech client including defense, medical device, I.T. and clean-tech companies. Moses is very active in Indiana and Louisville’s entrepreneur and business community. He co-founded and manages Southern Indiana’s only angel investment group, the Innovation Angels. He serves on the board and is President-elect of the Louisville Venture Connectors. He also serves in leadership and advisory roles for Greater Louisville Inc.’s Enterprise Corps, Velocity SI – Southern Indiana’s pre-seed accelerator, is a member of the Louisville Manufacturing and Logistics Network, and is on the board for Hope Southern Indiana. Before coming to Purdue Moses held management positions with both start-up and Fortune 500 companies, heading their marketing, communications, advertising, public and governmental relations efforts. He has also worked as a private consultant and as president of his own company, helping entrepreneurs develop their businesses. A former journalist, Moses also anchored the early morning news on Louisville’s CBS station for eight years. Among other honors over 26 years in broadcasting, his investigative reporting earned him an Edward R. Murrow and three Emmy awards.